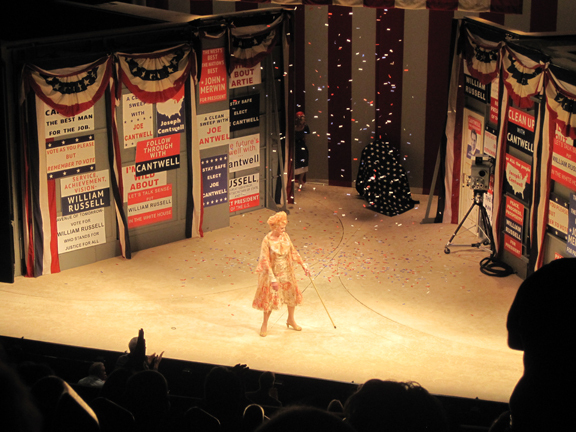 Life, Laughter and Paris: Give My Regards to Broadway! Give My Regards to Broadway! The Bronx is up, but the Battery's down. The people ride in a hole in the groun'. New York, New York, it's a helluva town! We're just back from New York and, like the song says, it is a helluva town. It's full of characters and I like that. You could hop down 5th Avenue in your p.j.s, with bananas sticking out of your ears, and no one would pay much attention. You might get a thumbs up or laugh, but that's it. (No, I didn't......I never wear fruit - I think it's so overdone). This visit we had planned on skipping a Broadway Show and taking in a comedy club instead. 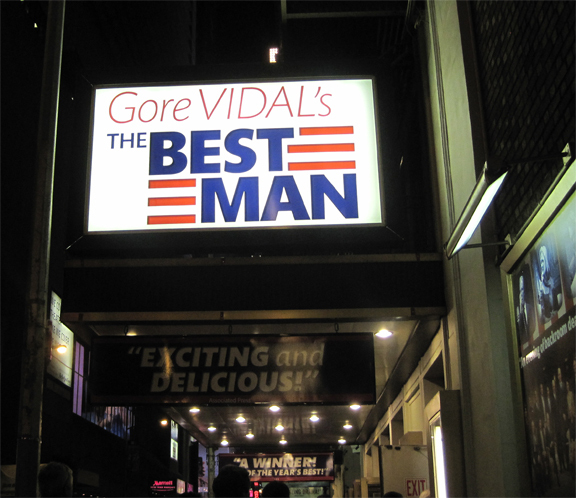 But, being right in the area of the Schoenfeld Theatre near curtain time, and with a play starring James Earl Jones, Angela Lansbury, John Larroquette, Candice Bergen and Eric McCormack among others, we couldn't resist seeing Gore Vidal's "The Best Man". Luckily for us there were still seats available. We thoroughly enjoyed every minute of the 2-1/2 hour play which seemed to be over in a flash (the true test of having a good time). Our seats were great! I don't think there are any bad seats in this theatre which, incidentally, is beautiful. 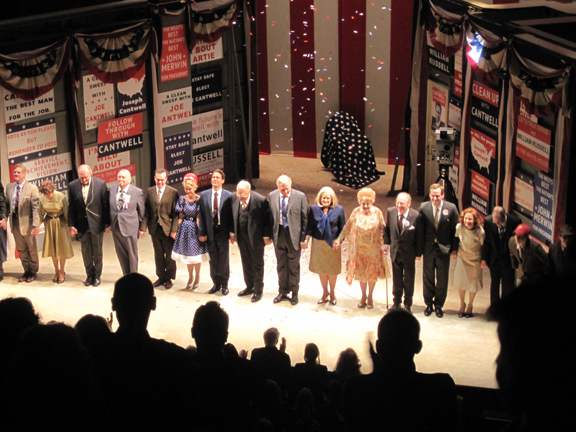 The whole cast was fantastic but it was a special thrill to see Angela Lansbury on the stage. You can't talk about Broadway without thinking of this great actress and she's amazing (she's 86 -this seems to be the month when I'm inspired by people in their 80's who are still very active and successful in their fields. Odd that). 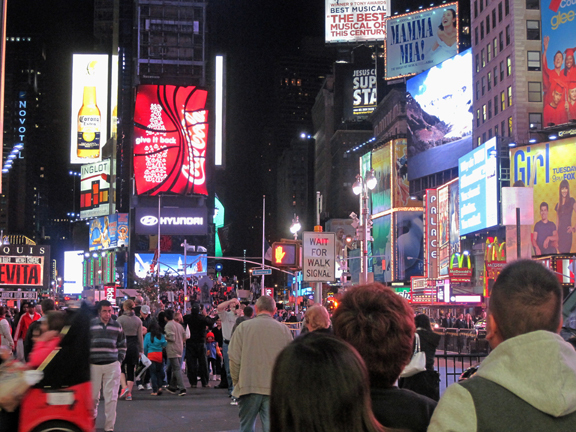 After the play, we wandered around Times Square just to see the crowds. Wow. There were crowds. This was a Thursday night with nothing special going on (other than the fabulous things that are always going on that is). Crowds and crowds and more crowds. People just looking at the lights which, I have to say, are pretty fantastic. I can't imagine bigger or brighter. It's just......well, Broadway magic! 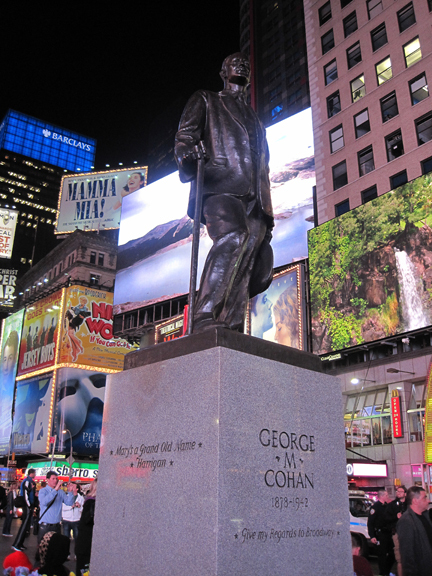 And in the middle of it all, George M. Cohan. Thanks for going there and taking photos. It sounds fun, but to an anxiety-ridden old bat like me, nerve wracking, too. You doing a Carmen Miranda in your PJ's down 5th Ave that bring a smile to the face. And I do Carmen Miranda so well! Pineapple hats are my favourite! (You'd love seeing the characters in New York - nothing is too strange for these people)!